We women will do some crazy things in the name of beauty, as I’ve stated here. Is it no surprise to find that this extends to spreading birdy doo doo on our faces? After all, we’ve done some “crazy things” in the past. Our foremothers experimented with many products, some of them quite dangerous, to make themselves lovely to behold. Wrinkle remedies abounded – a typical example demanded frankincense gum, moringa oil and cyperus grass, ground and blended with fermented plant juice; another boasted gall of ox and powdered ostrich egg. Our Victorian ancestors used belladonna (deadly nightshade) to make their eyes sparkle. One year ago, Shizuka Bernstein shared the Geisha Facial with spa goers at her New York Spa, Shizuka New York. It caught on. Soon, this new development in beauty was all over the news. The $180-$216, 5o minute long Geisha Facial is made from dried nightingale droppings imported from Japan and mixed with rice bran. Don’t worry, the poo is blasted with UV light to kill all the germs. As it turns out, this custom is an old, old one. 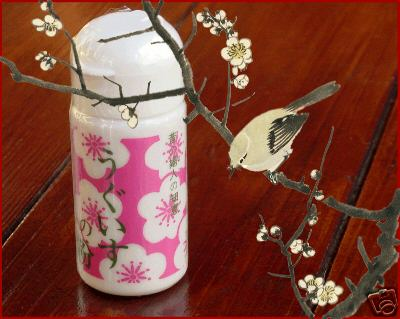 For centuries in Japan, both Kabuki actors and geishas used uguisu no fun, or nightingale droppings, to clean off their thick white makeup and soothe their faces; apparently, guanine, found in the droppings, helped their complexions. This article states that the geishas found that the guanine in the poo helped their complexions. These geishas’ makeup contained lead, which was quite harmful. As reported by Fox News, Shizuka Bernstein states that these women tried everything to take off the makeup, but the remedies did not work. Then they tried nightingale poop, and it worked! Not only that, it left their skin smooth. CNN also reports that the droppings were used to remove stains from delicate silk garments in Japan. Bernstein remembered this remedy from her mother. NY Post interviewed her. “The Japanese are obsessed to have white skin. Always. Porcelain-white skin,” she says. It may seem strange to us in our world of orange Lindsey Lohan tans. However, Livemint says that guanine is an amino acid loaded with ammonia, which means it has skin lightening and cleansing properties. If it’s good for your skin, it’s good for your skin. Customers are sining the praises of this innovative facial. Erin Zantello-Clary was skeptical when Bernstein first told her about this. After getting her facial, she proclaimed that her skin felt softer and her pores looked smaller. She described the whole process as simple and calming. Marilyn Philips, a 58 year old Upper West Sider, agrees. I see what she means, though I wouldn’t equate my face with the thing flowers come out of. How does this product work? No one really knows.. yet. Bird experts at both the National Aviary in Pittsburgh and Cornell University were rather at a loss to explain. Brian Keller of Bio Zone Laboratories has a speculation. A blogger at the Kiss and Makeup Blog speculates that since bird doo doo is quite acidic, it could work as a gentle peel. All that aside, we are brought to this question: What does the perfect lady do with all this birdy doo doo? Spread it on her face, of course.